More commonly a roof coating is installed on an existing roof to extend roof service life while the roof still has significant remaining service life. A coating installed on a new roof can provide a reflective surface to help reduce energy costs or it can be installed to act as a protective layer. A spray-applied reflective coating is being installed over an existing granule-surfaced asphaltic roof. The roof should have remaining service life. A coating cannot add life back into a roof but can prevent a roof from aging as quickly as it would without the coating, therefore extending a roof ’s service life. The coating should be compatible with the existing roof. The roof should drain properly. Areas of ponding water should be repaired and/or modified prior to coating. Coatings do not hold up well under areas of ponded water. While coatings may potentially stop minor leaks, the roof should be properly repaired and dried prior to coating application. Coatings may be able to seal pinhole leaks, which are leaks not visible to the naked eye. If the roof is leaking, the roof leak will need to be identified and repaired prior to any recoating; do not expect the coating to find and seal the leaks. It is critical to remove and replace any wet or deteriorated insulation. Be a component of the overall roof system. Roofing manufacturers sell systems; components are compatible and tested collectively. Use a roof coating that is part of the warranted system. Not be installed until the roof has appropriately weathered. 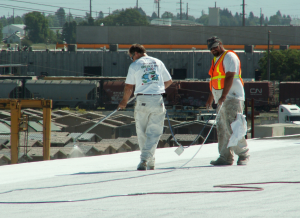 A coating may require a primer for adequate adhesion on new asphaltic roof systems. There are a number of benefits to coating an existing roof system. As shown in the case studies, page 3, a roof coating can provide energy-use reduction and cost savings. Similar projects can also receive tax incentives and energy rebates, providing additional savings to the building owner. The single best source for incentives for reflective roof coating installation is the Washington, D.C.-based Roof Coatings Manufacturers Association’s Reflective Roof Rebate Database. The RCMA database includes a comprehensive list of rebates, loans, grants, and tax credits pertaining to reflective roof coatings applied to low- and steep-slope roofs. The database covers all of the U.S. and includes state, local and utility company rebate programs. The database is updated every three months; California, Florida and Texas are updated on a monthly basis. For example, in a search done in July, there are 25 different incentives in the state of Florida, which includes three local rebate and financing pro- grams; 20 utility-based loans, rebates and incentive programs; and two federally funded programs. It’s import- ant to note that the RCMA Reflective Roof Rebate Database is available for anyone to use; finding incentives and rebates in your area has never been easier. Coatings extend the service life of roofs and provide energy-saving benefits for building owners and homeowners. Roof coatings are designed to protect and extend the useful service life of roof assemblies for new construction and, more commonly, existing roof coverings. Reflective roof coatings extend the life of the roof by reducing heat transfer into the building, decreasing thermal shock (thermal expansion and contraction of the roof membrane) and helping to mitigate leaks.